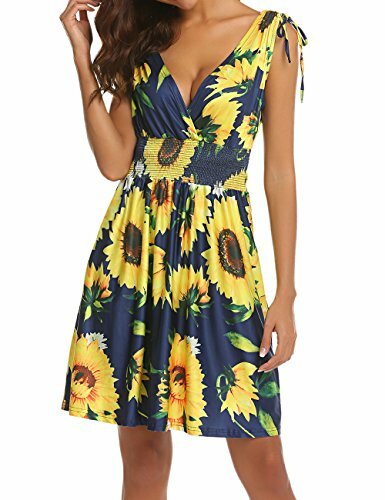 LuckyMore Women's Low Cut Floral Printed Summer Above Knee Sleeveless Dresses Yellow M by LuckyMore at SCRHI. Hurry! Limited time offer. Offer valid only while supplies last. Material: Polyester+spandex,very lightweight and soft material.Silky and not see through. Breathes well, flattering, and super comfortable! Nice and cool to wear on hot summer days. Design:Colors are very pretty and summery! V neck,backless,above knee, Bohemian Print,elastic waist,A Line and flowy. The whole style is very flattering and forgiving,creating a relaxed but pretty fit. Occasion:This cute drss looks great by itself,you can wear it around the house,to work or to a wedding party.Besides,It also works great as a swimsuit cover up at beach and the pool. It packs well,wrinkle free and dries quickly.Perfect for your beach,travel or cruise vacation. Size: Please refer to seller's Size Chart In the Last Picture or description before ordering. Thank you!